Learning science is one of the hardest things a person can do. It often forces us to shift the way in which we see the world. The process is demanding, but is ultimately rewarding, because it allows us to interact with nature in a deeper, more meaningful way. If we continue down this road, we become empowered with the means to shape our environment - we become engineers. In the early 1990s, Harvard physics professor, Eric Mazur, was teaching advanced physics courses to bright students. He gave exciting lectures, complete with compelling, thought-provoking demonstrations. He was praised by students for his clarity in delivering the material. Then, something unusual happened. Mazur set out to gauge the effectiveness of his teaching scientifically. He employed a standardized test known as the Force Concept Inventory (FCI) to assess his students' conceptual understanding of mechanics, before and after teaching his courses. The results surprised him. He was not surprised that most students entering his class came in with a relatively weak understanding of mechanics. He was, however, astounded that after having taken his mechanics course, his students performed only marginally better on the FCI. Mazur was dumbfounded. In the years that followed, he set out to determine, scientifically, what constitutes effective pedagogy for science education. Traditional lectures, where a teacher communicates information to students who dutifully take note of the content, are fairly useless. At its best, such an approach can be entertaining, but not cognitively stimulating for students. In fact, cognitive function in students while attending a lecture (even a good one) has been shown to be lower than while sleeping. In this context, who can fault a student for sleeping through a lecture? Though the title of this article is less catchy than the Aerosmith classic rock tune that it alludes to, an elevator is, nonetheless, an excellent place to solidify one's understanding of mechanics. I rode up an elevator from the ground level to the eighth floor of a condo building long ago with my daughter, who was three at the time, to visit her great-grandmother. As we approached our destination, and the elevator began to slow down, my daughter asked, "Daddy, are we going down?" "Amazing," I thought, "kids can sense acceleration, and have already developed the same false preconceptions about it that they bring to their introductory mechanics courses." It makes sense that people, and all animals for that matter, can sense acceleration, as we live in a dynamic world, and acceleration, which is the rate of change of velocity, may be thought of as the forecaster for motion. If one can detect one's own acceleration, then one can accurately predict one's future position (provided one knows one's own current position and velocity with accuracy). Until recently, I harbored mixed feelings about hybrid cars. On the one hand, they decreased fuel consumption significantly, while on the other, they were very expensive, and entailed more parts than a standard combustion engine car, which translates to more maintenance costs down the road. I would never have recommended that anyone buy one. At best, an environmentally conscious consumer could undertake a lease, pay a bit more in total costs, but feel they'd done a small service for the atmosphere. In 2012, it seems to me that hybrids have rounded the bend, and crossed a very significant threshold. In some cases, it appears that the purchase of a hybrid is, in addition to environmentally considerate, cost beneficial. A new technology like hybrids had a lot going against it in the early going. Purchase prices were high since production quantities were low and R&D costs were significant. Also, new technologies are less reliable than tried and true ones; they have not been through the iterations that come through multiple generations of development. This coming Friday, a friend and I will be performing music at a bar (pop, rock, reggae). It will be our first show together. 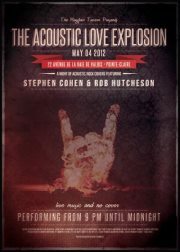 Our band is shamelessly called, "The Acoustic Love Explosion." We have been practicing together for a few months. I will be playing the drums, he the guitar, and we will both be singing. I have never witnessed a performance having this musical arrangement before, and am curious to see how the audience will react to it. In particular, I wonder if the lack of a bass guitar will be noticable, and whether the sound will feel empty. This first show really feels like an experiment - one that, if successful, will spawn similar ones in the future. Sometimes, life, from the moment we are born until the moment we die, feels like a giant series of experiments. Some might prefer to substitute the word "experiments" with "experiences", but really, the difference is quite subtle. An experiment is possibly even more accurate, as it implies that some lesson will be learned, and retained in our memory. Why Don’t Airplanes Flap Their Wings? All articles written by Stephen Cohen. Watermark theme. Powered by Blogger.